With the big day on the horizon, you still need to iron out all the little decorative details. From how guests sign in to flowers and signage, deciding upon these details feels frustrating, but your choices will make a big impact on your experience and memories. Refuse to settle, just to get items off your plate. If you resort to that, you’ll end up with results you don’t like, and your wedding will feel boring. Here are a few design and decor tips to have a fresh and eclectic wedding. When guests arrive, they see a canvas with a tree on it. There are various finger-paints in primary colors to choose from. Guests place their thumbprints on the tree and may write in their names around their thumbprints in permanent marker. Make sure the paint is non-toxic for little ones and washable for all! The guest canvas gives a great first impression of a fun and eclectic wedding. 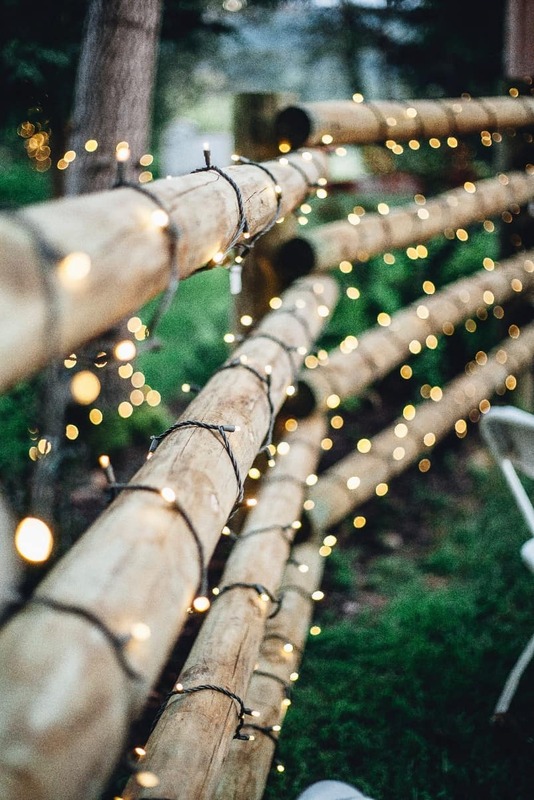 String lights for wedding decoration can go one of two ways — whimsical or tacky. Aim for whimsy and don’t mix too many types of string lights together. Look for types that will blend into the surroundings and won’t get tangled up. You want a cross between stars and fireflies for your ambient mood. String them up with a cascading appearance, and space out the lights. When lighting and cords are involved in decorating, safety concerns arise. Always use the right bulb with the appropriate wattage if bulbs are needed. For powering string lights, choose outdoor-rated extension cords, and select decorative lighting created for outdoor use. Weather-resistant receptacles take dampness, heat and cold without damage. For shorter and fairer periods of time, opt for battery-operated lights, so you don’t have to deal with the cords. Keep batteries on hand. Flowers are an essential and expensive part of wedding planning. You want affordable flowers, but you don’t want to go too cheap or boring with your selection. Choose in season blooms to decorate affordably and uniquely for your wedding. 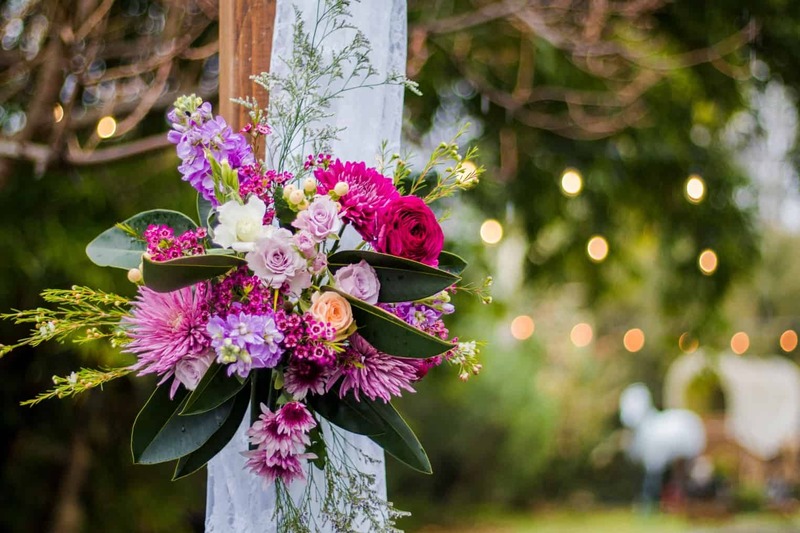 Different blooms may be in season at different times of the year, and spring provides the peak growth time for most flowers, especially since spring and summer are typical wedding seasons. Build bouquets and table decor out of lilacs, irises, orchids and dahlias. For fall, select marigolds, daisies, lilies and Queen Anne’s lace. For winter, choose roses, amaryllis and carnations — don’t be afraid to add evergreens into the mix. Save money by creating a garland out of the flowers to hang or go for simple and classic tabletop centerpieces with single-stemmed flowers. Add seashells and other whimsical details to fill in more for the eyes. Purchasing several yards of fabric or investing in multiples of the same tablecloth gets expensive. Use mismatched vintage linens instead for a stylish and eclectic vibe. There are many types of textiles, patterns and colors to choose from. Searching for the linens may require more time, but it makes the process more fun — check out antique stores, yard sales and family attics with your bridesmaids. Ask family members to donate their unwanted linen to you, and you can donate what you don’t want to keep after the wedding. That makes your wedding eco-friendlier, too. Sandwich and chalkboards are on the way out, and custom signage is on the way in. Make your wedding more creative by hiring a calligrapher for signage. Your big day should be as eclectic, fun and dazzling as you and your partner are as a couple. As your wedding date closes in, you may feel overwhelmed by all the choices remaining when it comes to the little decorative details. Don’t fret, and don’t settle. 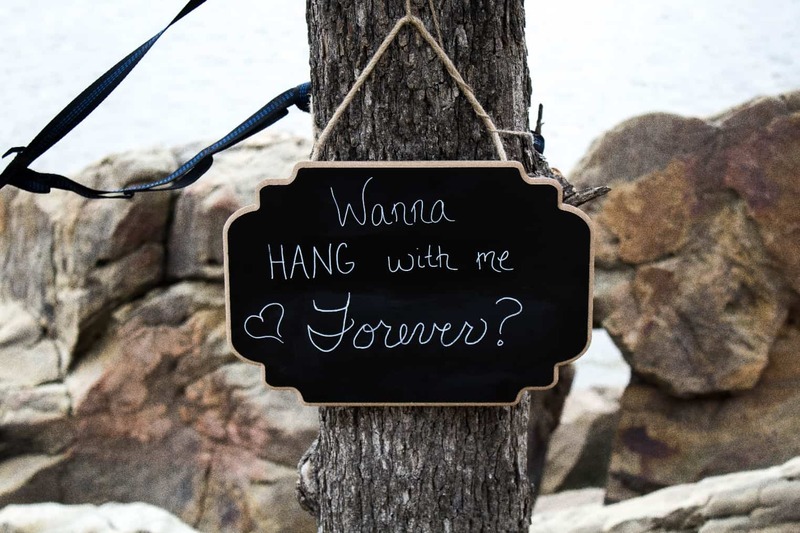 From a thumbprint guest canvas to hiring a calligrapher for signage, use these five tips to create a wedding unique to you. Simple, creative and in season ideas go a long way to making your wedding fresh and eclectic without too much forethought.